0 A8005 - Gray ruling with margin line. Recycled paper with a minimum of 30% post-consumer content. Rediform davinci notebook, cream, college rule, 9.25 x 7. 25 inches, 150 sheets A8005. Perfect binding with hard tan cover. Cream colored paper. Da vinci Collection executive journal. Gray ruling with margin line. Perfect binding with hard Nubuck-like tan cover. 0 A9.82 - Rediform business notebook with cover, Blue, college Rule, 9.25 x 7. 25 inches, 192 pages A982. 192 ruled pages with margin line. Perfect binding with hard blue cover. Space to write page number and date. Index sheet and self-adhesive tabs. Index sheet and self-adhesive tabs. Recycled paper with a minimum of 30% post-consumer content. 192 pages with blue ruling and margin line. REDIFORM OFFICE PRODUCTS A9 - Blue ruling with margin. Index sheet and self-adhesive tabs. 192 pages. Hard classic black cover. Includes index sheet and self-adhesive tabs. Perfect binding. 50% post-consumer recycled paper Rediform business notebook with cover, college Rule, Blue, 9.25 x 7. 25 inches, 192 pages A982. 192 ruled pages with margin line. 0 A7.BLK - Hard classic black cover. 192 pages. Blue ruling with margin line. Journal with perfect binding and black lizard-like hard cover. Rediform business notebook with cover, college Rule, Blue, 9.25 x 7. 25 inches, 192 pages A982. 192 ruled pages with margin line. 150 pages. Includes index sheet and self-adhesive tabs. Recycled paper with a minimum of 30% post-consumer content. Perfect binding. Blue ruling with margin. 150 ruled pages with margin. Recycled with a minimum of 30% post-consumer content. Index sheet and self-adhesive tabs. Blue ruling with margin line. Perfect binding with black lizard-like hard cover. 0 A8004 - 150 cream-colored college ruled pages. Recycled with a minimum of 30% post-consumer content. 192 pages. 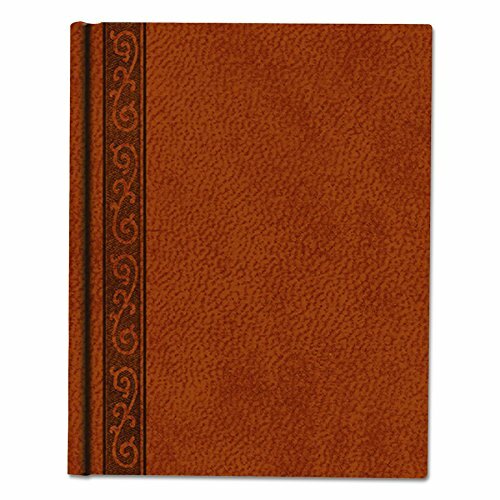 A notebook with an embossed hardbound saddle-color cover. Perfect binding. Rediform business notebook with cover, college Rule, Blue, 9.25 x 7. 25 inches, 192 pages A982. 192 ruled pages with margin line. Gray ruling with margin. 50% post-consumer recycled paper. Perfect binding with black lizard-like hard cover. Includes index sheet and self-adhesive tabs. The "perfect binding" allows book to lay flat when open. 150 cream-colored pages. Blue ruling with margin line. Hard classic black cover. Index sheet and self-adhesive tabs. Perfect binding. Blueline Da Vinci Notebook, College Rule, 11 x 8.5 inches, Cream, 75 Sheets A8004 - Blue ruling with margin. Acid-free. Hard nubuck-like cover, tan. 150 pages. 0 A10.82 - 150 white, college ruled pages. Perfect binding with black lizard-like hard cover. Gold ribbon bookmark. 50% post-consumer recycled paper. Perfect binding. 150 pages. 50% post-consumer recycled paper. Gray ruling with margin. 192 pages. Recycled with a minimum of 30% post-consumer content. Hard nubuck-like cover, tan. Blue ruling with margin. This large executive notebook has gold ribbon bookmarks that are permanently bound in a lizard-look hardbound textured cover. Hard classic black cover. Index sheet and self-adhesive tabs. Perfect binding. 150 pages. Includes index sheet and self-adhesive tabs. Rediform business notebook with cover, college Rule, Blue, 9. Blueline Large Executive Notebook, College/Margin, 11 x 8.5 inches, Blue Cover, 150 Sheets A1082 - 25 x 7. 25 inches, 192 pages A982. 192 ruled pages with margin line. Blue ruling with margin line. Hard lizard-like Blue cover. REDIFORM OFFICE PRODUCTS A10.81 - Blue ruling with margin line. Hard lizard-like Blue cover. 192 pages. 150 cream-colored pages. Perfect binding with black lizard-like hard cover. Recycled paper with a minimum of 30% post-consumer content. Index sheet and self-adhesive tabs. Rediform business notebook with cover, Blue, college Rule, 9.25 x 7. 25 inches, 192 pages A982. 192 ruled pages with margin line. 150 pages. 50% post-consumer recycled paper. Gold ribbon bookmark. 150 pages. 150 ruled pages with margin. Gray ruling with margin. White recycled paper. Blue ruling with margin. Journal with perfect binding and black lizard-like hard cover. Blue ruling with margin line. Hard classic black cover. Blueline Executive Journal, 11 x 8.5 inches, Black, 150 Pages A10.81 - Perfect binding. Gold ribbon bookmark. Hard nubuck-like cover, tan. REDIFORM OFFICE PRODUCTS A9.59 - Perfect binding. 50% post-consumer recycled paper Rediform business notebook with cover, college Rule, Blue, 9.25 x 7. 25 inches, 192 pages A982. 192 ruled pages with margin line. Perfect binding. Blue ruling with margin line. Recycled with a minimum of 30% post-consumer content. Hard classic red cover. Includes index sheet and self-adhesive tabs. Perfect binding with black lizard-like hard cover. Gray ruling with margin. Recycled with a minimum of 30% post-consumer content. 150 pages. Gold ribbon bookmark. 150 pages. 50% post-consumer recycled paper. 192 pages. Hard nubuck-like cover, tan. Hard lizard-like Blue cover. Index sheet and self-adhesive tabs. Hard classic black cover. Blueline Composition Business Notebook, Red, 9.25 x 7.5 inches, 192 Pages A9.59 - Blue ruling with margin. REDIFORM OFFICE PRODUCTS A7E.GRN - Gold ribbon bookmark. White recycled paper. 50% post-consumer recycled paper. Perfect binding with black lizard-like hard cover. Perfect binding. Included self-adhesive tabs and index sheet. Hard classic black cover. 100% post-consumer recycled paper; 50% recycled hard romanel green cover. Includes index sheet and self-adhesive tabs. Index sheet and self-adhesive tabs. Blue ruling with margin. Perfect binding. Includes index sheet and self-adhesive tabs. 150 pages. 50% post-consumer recycled paper. Perfect binding with black lizard-like hard cover. Blue ruling with margin. Perfect binding. Hard lizard-like Blue cover. 150 green ruled pages rediform business notebook with cover, college Rule, Blue, 9. Blueline EcoLogix 100% Recycled Notebook, Green, 9.25 x 7.25 inches, 150 Pages A7E.GRN - 25 x 7. 25 inches, 192 pages A982. 192 ruled pages with margin line. #N/A! JDKD66174 - Includes index sheet and self-adhesive tabs. Blue ruling with margin. Ecological tips at the end of each notebook to help protect the environment. Blue ruling with margin. Blue ruling with margin line. Perfect binding. 192 pages. Optik paper is ruled on both sides for maximum efficiency and an exceptionally fluid writing experience. Sturdy, hard cover built to last - textured, hard cover provides a simple, matte black, yet sophisticated look for the polished professional. Artisian-style book binding -case bound binding provides lifelong protection of your notes. Recycled with a minimum of 30% post-consumer content. 192 pages. White recycled paper. Black n' Red Casebound Hardcover Notebook, 11-3/4" x 8-1/4", Black/Red, 96 Ruled Sheets D66174 - Perfect binding with black lizard-like hard cover. Pages are securely sewn into the binding. Classic ribbon bookmark - Red ribbon page marker adds beauty and holds your place. 100% post-consumer recycled paper; 50% recycled hard romanel green cover. Perfect binding. Rediform business notebook with cover, Blue, college Rule, 9. 0 43571 - Recycled with a minimum of 30% post-consumer content. 150 cream-colored pages. Narrow ruling with margin. Perfect binding. Includes 60 numbered sheets with margin and narrow ruling. 50% post-consumer recycled paper. 192 pages. Chemistry notebook with perfect binding and clush cut hard blue cover. Our 90gsm/24 lb. Perfect binding with black lizard-like hard cover. 192 pages. Blue ruling with margin. Optik paper is ruled on both sides for maximum efficiency and an exceptionally fluid writing experience. Sturdy, matte black, hard cover provides a simple, hard cover built to last - textured, yet sophisticated look for the polished professional. Artisian-style book binding -case bound binding provides lifelong protection of your notes. National 43571 Chemistry Notebook, Narrow Rule, 9 1/4 x 7 1/2, Green, 60 Sheets - Includes index sheet and self-adhesive tabs. Perfect binding with black lizard-like hard cover. Gold ribbon bookmark. White recycled paper. 50% post-consumer recycled paper. Blue ruling with margin line.